I would like to know if it is possible to add a status to my submissions received. 2 - the customer is choosing the date of the arrival. After that, I check the submissions received in the day, and according to the availabilityn, I would like to put a customized status like "Booking accepted" or "Booking refused". Unfortunately, you can't do that on the submission page. Perhaps you could create email folders for each status on your email client and assign the notifications emails accordingly? Is it possible to develop this feature ? I think it can be useful for many people ? We are not sure but we can add your request to our user's wishlist. Though, we can't assure if this would be approved by our developers since we do not have much request about this feature. However, if any information's available about this or related to this request, we'll let you know. This is possible using edit button on submissions page and using a Hidden Box available on Power Tools on the form builder. People who submit this form will not see this field but you will be able to edit it from Submissions page. I believe there could be a workaround using Google Spreadsheet integration. 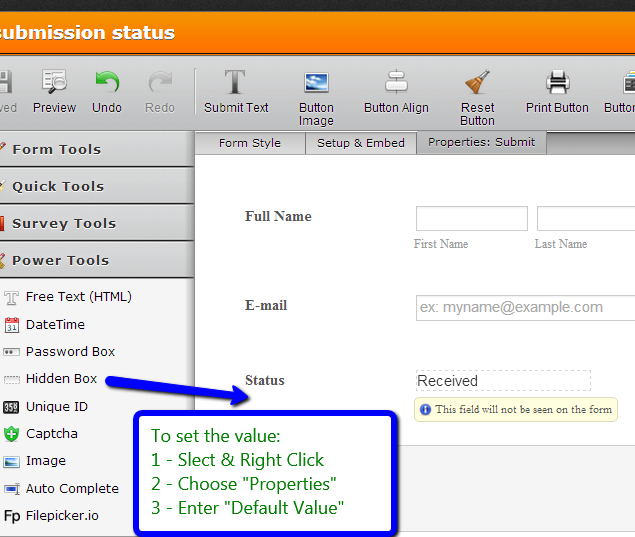 Simply add the hidden field(named Status) with a default status. Your submissions would be added to a Google Spreadsheet with a column named "Status". You would be able to edit this column(not the headings) and sort it as you wish. Here are is a short visual guide to help you. Many Thanks to Jotform !